It takes years of tasting, training and probably a lot of natural talent to be a true wine connoisseur, but the rest of us can appreciate the art of imbibing. regardless of expertise. Here are some helpful tips – and handy devices – that you can use while hosting your next wine-and-cheese gathering. Cheers! 1. This Original Rabbit Corkscrew is a classic favored by the professionals. It can pull a cork in three seconds and then automatically release it. Its ergonomic design allows it to open any size wine bottle, and it comes with a 10-year warranty. Available at Bed, Bath & Beyond, 3617 Ambassador Caffrey Pkwy., Lafayette, (337) 988-5423. 2. A slate cheese tray is attractive and easy to clean, from World Market, worldmarket.com. 4. 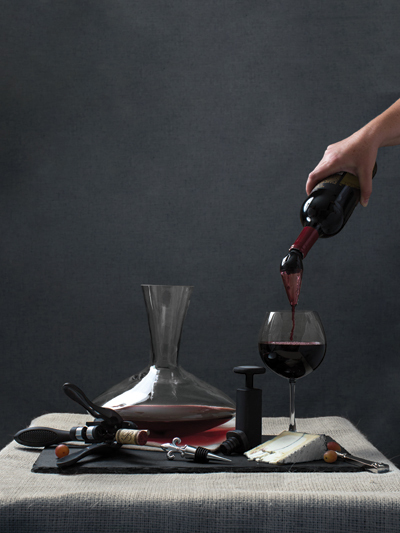 A decorative bottle stopper with a tight seal preserves age and freshness of leftover wine. Avoid cleaning your decanter with soap. The decanter’s shape makes it difficult to get the residue out. Instead, try using a mixture of crushed ice and coarse salt ­— they’ll remove any residual wine without leaving behind their own aroma.